Don't dumb me down from the Guardian. Reporters dumbing down articles, especially statistics. ScienceLinks (sponsored by AAAS and MCI): Resources for classroom. Developed around AAAS 2061 Benchmarks for Science Literacy. Underwater archaeological excavations directed by Franck Goddio in the bay of Aboukir, Egypt : Thonis-Heracleion, the sunken Royal Quarters of Alexandria, and shipwrecks off the Philippines: San Diego, Griffin, Royal Captain, Lena Shoal junk, Santa Cruz junk, and off Egypt: Napoleon's fleet and ancient vessels. Weather Underground shows night sky for your zip code. go to "Images". Europa orbit 2 and orbit 6 recommended by SJMNews. Recommended that you watch the full animation (8 minutes) at high resolution. Requires Flash 8. If fermented fruit fell in the forest, and human ancestors were there to eat it, would their descendants want a cold beer? Maybe. A new theory trying to explain the human thirst for alcohol maintains that primates and other animals, deep in the past, developed a taste for fruit. Exposure to the ethanol of decomposing fruit might have played a role in the evolution of humans, says Robert Dudley of the University of Texas at Austin. His theory is this: Ripe fruit appears only seasonally in a tropical forest, and fruit-loving animals benefit from the extra calories. Because it helped them survive, early human ancestors probably were attracted to the smell and taste of fallen, overripe fruit. If this craving for ethanol were sharpened for a few million years or so, modern humans would be left with a particular liking for margaritas. The theory (except for the margarita part) is explained in the current Quarterly Review of Biology. The theory might even explain why moderate alcohol consumption has certain health benefits, Dr. Dudley said. The problem today is abundance. The ability to find trace amounts of alcohol might have helped early humans survive. Today, he said, finding alcohol doesn't take a lot of skill, and humans instead fall victim to alcoholism and drunken driving. "Studies of historical exposure to this substance can accordingly provide information for interpreting modern patterns of alcohol consumption and abuse," he wrote in the journal. Did tea and beer make Britain great? The Times (of London), May 10, 2000. A Cambridge don says that a change in drinking habits was the reason for the industrial revolution. 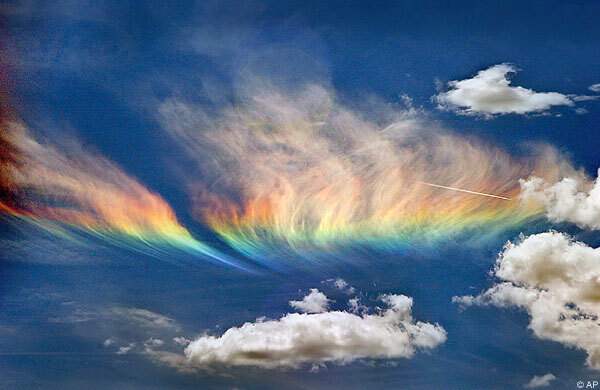 Fire Rainbow - The fire rainbow is a very rare atmospheric phenomena. The picture was captured this week on the Idaho/Washington border. The event lasted about 1 hour. Clouds have to be cirrus, at least 20K feet in the air, with just the right amount of ice crystals and the sun has to hit the clouds at precisely 58 degrees. Don't like the weather? Blame the Man on the Moon from Christian Science Monitor, 2000-June-15. Effects of tidal action on climate. CVC - "Little Ice Age"
Researchers Challenge Water-Flow Model - New York Times: Some are challenging earlier ideas about how water naturally flows because the streams studied then were not "natural archetypes" but rather the artifacts of 18th and 19th century dam-building and deforestation. Name Finder Origins of names (first names) Note: occasional problems rendering this page. Book Review: Expert Political Judgement: How Good Is It? How Can We Know? from "The New Yorker"
Classroom Connect Extensive listing of educational resources on the Web. Science Education Academy of the Bay Area lists programs offered by 61 members, from Lawrence Hall of Science to Coyote Point Museum, NASA/Ames and Stanford Linear Accelerator. Free copies of the program listing, the SEABA Journal, are available from the Web site or by calling (415) 241-2730. Industry Initiatives for Science and Math Education, a Bay Area consortium that brings teachers into the laboratory. GameTheory.net : Variety of educational materials, including collection of tools that let students try out various strategies for classic games in this domain. Safe web colours for colour deficient vision by Christine Rigden, BTexact Technologies. Link original given in article Now You See It, Now You Don't in Computer, July 2002, and subsequently updated at request of author. Advice on choosing colors for readability by people with varying degrees of colorblindness. Nancy Ferguson's third-grade class Mount Everest home page Shows what one class did with information from the 1996 Live on Everest expedition.